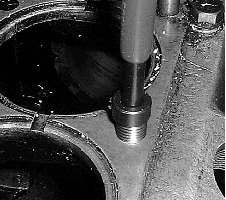 I expect you’ve all been in a situation at some time when you have managed to strip the thread in the crankcase or other major component, if not that sinking feeling is just lurking around the corner waiting pounce when you least need it! What can be done? You have three basic choices. You can re-tap the hole one size larger and use a larger diameter bolt or stud. If you use this solution the component being bolted down will have to have a clearance hole drilled in it to take the larger diameter bolt or stud. If you’re dealing with stripped stud hole you can re- tap the hole one size larger and use a” stepped “ stud . One end is the larger thread the rest of the stud is the original diameter and thread. 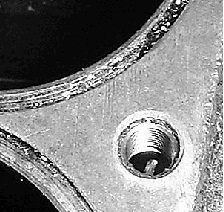 The best solution, particularly if your dealing with a thread in an aluminium casting, is to fit a thread insert. 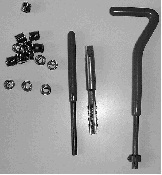 These are sold under a range of names e.g Helicoil, Recoil, and come as a kit made up of a tap, a quantity of thread inserts and an insertion tool. Each kit only covers one thread size. Most of you D.I.Y. 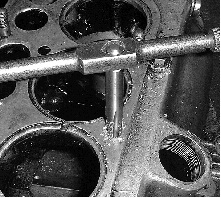 motor engineers will either have used or seen examples of the first two methods so I will go into greater detail of how you repair the thread using a thread insert using 'Recoil' thread inserts. 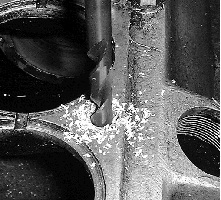 To fit an insert the stripped hole is drilled and tapped using the drill and special tap supplied in the kit. The tap will be marked with the finished thread size so don’t get it mixed up with your other taps and dies. When you buy the Recoil set for each thread size they will be marked with a tapping drill size. These are usually very unusual drill sizes so buy a drill of the right size and put it with the kit and ONLY use it for that purpose. This effectively forms a thread within a thread, the internal thread being the same as the damaged thread it replaces. This allows you to keep bolts and studs to the standard size. Make sure that the hole depth is correct for the number of threads on the insert as once you start inserting the insert you will find it almost impossible to screw it back out as you will be unwinding the ‘spring’ and it will grip the sides of the hole. It actually takes approx. 3 minutes to do the job, about the same as drilling and tapping an oversize hole without the bother of an oversize stud. This article originally appeared in CA7C Seven Focus in Oct 2002 pp16-17.